It’s Taco Tuesday, my favorite day of the week! My family just loves tacos because you can make them in so many ways. 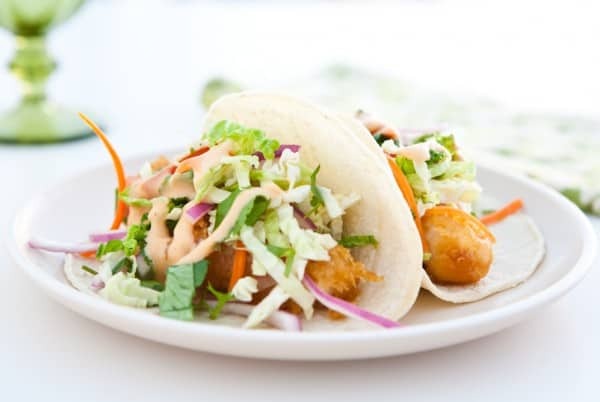 Today I’ve got some delicious beer-battered fish tacos with a simple slaw and a yummy addictive sauce to share with you that I made last week. I found some shark on sale at my local grocery store, and fried it up in a simple beer batter. Any type of firm white fish will do though, like cod, mahi or grouper. If your ever in doubt, just ask the person at the fish counter which fish is best for deep frying. For the slaw, I just used thinly sliced cabbage, matchstick carrots, onions, tomato and cilantro. Then I let it marinate in a little vinegar and lime juice. It couldn’t be easier. For the sauce, I wanted to re-create a version of the Yum- yum or shrimp sauce served at Japanese steak houses. It’s also just known as white sauce, or that crazy addictive white sauce that people drown everything in cause it’s just that good. This yum yum sauce is very close, except I added lime juice to compliment the fish. For a spicy kick, add a little Korean red pepper or cayenne pepper to the sauce. Heat oil to 350°. Add self rising flour, paprika and beer to a large bowl. Mix well. Add fish chunks and coat well. Drop fish in hot oil, frying until golden brown. Add all ingredients to a large bowl and mix well. Set aside. Add ingredients to a large bowl and mix well with a whisk. You can also mix in the food processor or blender. I’m coming over these look fantastic! These look great! I’m going to have to start taco Tuesday. There are so many variations of tacos that I want to try out. This one is on the list now. That white sauce is only my favorite sauce EVER!! I make it all the time at home….such a great dipping sauce for steak kebabs. So a few girlfriends and I went to eat Japanese the other night, and yes….I dip everything into IT. My steak, my veggies and even my friend rice was drizzled with it. Yes….I agree. IT’S THAT GOOD!!! I love all the flavor going on in the Yum-Yum sauce! 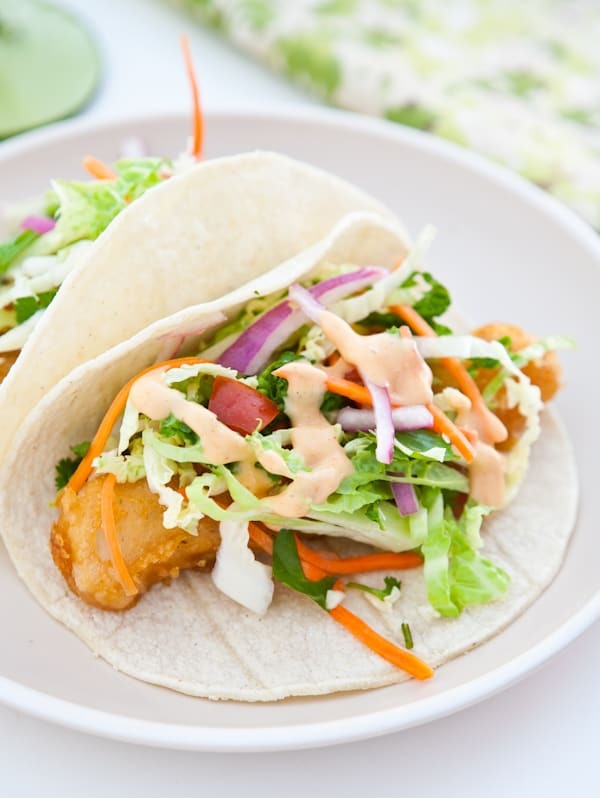 Fish tacos are one of our favorite meals. This looks great! I do love fish tacos and I can’t wait to try the yum-yum sauce! Gorgeous photos too! 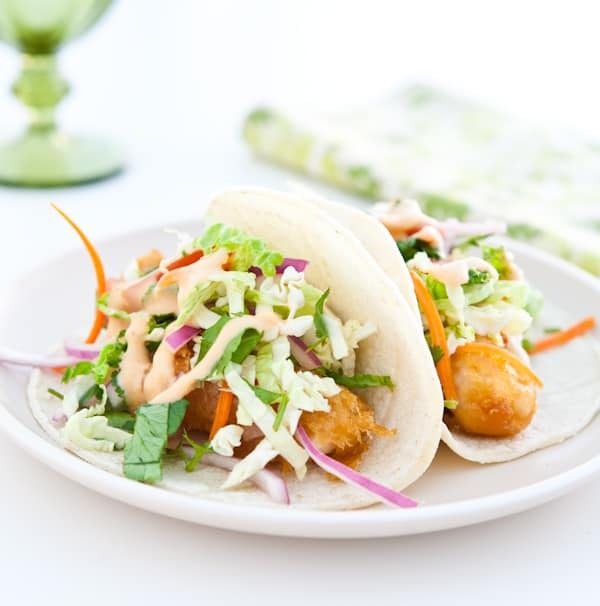 Fish tacos make such a great weeknight meal and the sauce sounds amazing. Yum yum indeed. So aptly named! Drooling, Angie! We love taco Tuesday and especially love fish tacos. The sauce is perfect! I’ve only recently starting loving & craving fish tacos. And I know how good that yum yum sauce is. Now I’m wanting some fish tacos so I can drown them in it! That is Yum-yum for sure! Yummo — I could totally go for some of these right now! I made this for my family and it was loved by all! I made my own fish tacos, but made this Yum Yum Sauce and it was great! Even my 2 year old loved it on the coleslaw. I used ketchup instead of tomato paste and honey instead of agave. Thanks for a great recipe! The sauce is awesome! Love it with the smoked paprika. I’ve been in mourning ever since the restaurant with my favorite fish tacos closed. I can’t remember if I found you on Pinterest or a web search, but I’m so glad I found your recipe! The Yum Yum sauce is awesome!! The smoked paparika gives it that kick. Love it! !